Information on the best national parks and reserves of Uganda. Devastated by war and poaching in the 1980s, Queen Elizabeth NP (QE if you're feeling familiar) is frequently characterised as a poor Ugandan relation to the great savannah reserves of Tanzania and Kenya. This widespread perception is surely due for revision. An immaculate lakeshore location below the Ruwenzori Mountains and a lush cover of green grassland dotted with tall cactus-like candelabra trees and sunken crater lakes make this perhaps the most conventionally scenic of all East African savannah reserves. Furthermore, the game is now well on the way to recovery: QE today offers reliably good — and sometimes exceptional — wildlife viewing, with the usual savannah suspects boosted by several less common species. Substantial elephant and buffalo herds are almost certain around Mweya Peninsula (the park's main tourist centre) and lion are regularly seen. Mweya is also acquiring an enviable reputation for leopard sightings and offers a high probability of encountering Giant forest hog — the only park in East Africa where they're regularly seen by day. Chimp tracking can be undertaken in Chambura Gorge, while launch trips on the Kazinga Channel are good for antelope, hippos, crocs and a selection of the 565 bird species recorded within the park's relatively small area. QE is a park of three distinct sectors. Mweya, overlooking Lake Alfred and on a clear day offering great views to the Ruwenzori peaks, hosts a large swanky hotel, as well as a cheaper hostel, resthouse and campsite. In the Maramagambo Forest — a rich site for birds and primates — an intimate luxury tented camp is perched on the edge of one of the park's myriad crater lakes. Basic, affordable huts are available in the remote Ishasha sector, renowned for its tree-climbing lions and wilderness atmosphere. In 1888 the explorer Henry Stanley obtained a rare unclouded view of the peaks forming the 120km-long Ruwenzori Range, thereby (he announced) resolving a question that had troubled geographers for centuries: the location of the snow-capped Lunae Montes — Mountains of the Moon — cited in Ptolemy's Geography as the source of the Nile. The connection made by Stanley is actually somewhat debatable, since Ptolemy's knowledge of the African interior was based flimsily on third-hand information sourced from Indian Ocean traders more likely to have been familiar with Mounts Kilimanjaro or Kenya. Nevertheless, the association between the Ruwenzoris and the Mountains of the Moon has proved enduring — and unintentionally apt. The upper moorland of this vast range, all multihued heath studded by desolate stands of giant lobelia and groundsel, does indeed possess a disarmingly otherworldly quality: "a world of fantasy where nothing is real but only a wild and lovely flight of imagination," wrote the explorer Eric Shipton, who ascended the peaks in 1932. The Ruwenzoris are also, when the cloud lifts to reveal the lunar glacial peaks and deep tarns sunk at their base, perhaps the most scenically imposing and ethereal of all East African montane landscapes — and the most challenging for dedicated hikers. Closed since 1997 due to cross-border rebel activity, Ruwenzori NP re-opened in 2002 and is normally explored over 3-7 days along variations of the so-called loop trail, which skirts the base of the glacial peaks. Notoriously boggy at the best of times, these trails are best avoided during the rains, except perhaps by diehard mud-wrestlers (June-August is the perfect time to hike). Only experienced and properly equipped technical climbers should attempt the peaks, three of which rise to above 5000m. First exposure to the dank, mysterious rainforest interior — at least for those used to seeing its inhabitants nose-in-lens on television documentaries — can be anti-climactic. A delightful aural overload is guaranteed, courtesy of a chattering cast of monkeys, birds and insects. It's more difficult, however, to put faces to the voices, which emanate from neck-craning angles in a canopy so thick it can render a troop of large monkeys invisible. Because of this, it's tempting to put forward Bigodi Wetland Sanctuary (an exemplary community-based walking trail, bordering Kabale Forest NP) as the most exciting and least frustrating introduction possible to East Africa's rainforest fauna. Clear views from the swamp edge into the gallery allow for good sightings of Red colobus, Black-and-white colobus, Grey-cheeked mangabey, Red-tailed and possibly L'Hoest's monkey — very occasionally chimps too. The birding is magnificent: the guides, who really know their stuff, regularly pick up as many as 40 forest-associated species in an afternoon, including Grey parrot, Yellow-billed and Double-toothed barbets, and a trio of colourful turacos.Within the NP, chimp tracking (not yet up to Mahale's standards, but improving every year as the animals become better habituated) and nocturnal forest walks are two further features that make this arguably the most rewarding gorilla-free forest in Uganda. The ease of access on public transport from Fort Portal and the wide range of accommodation (one smart tented camp, a NP campsite and a few guesthouses at Bigodi) further boost its stock. So, too, does a field of lovely crater lakes between the park and Fort Portal, offering a similar range of accommodation. Only 2000 years ago, the Albertine Rift — the section of the Rift Valley running from Lake Albert to the northern shore of Lake Tanganyika — was swathed in a continuum of ancient rainforest. Then agriculturists settled in the region, gradually clearing the trees to make way for crops, a process that accelerated in the colonial era to leave behind perhaps a dozen viable relic forest patches, of which Bwindi is today the second largest (after Nyungwe in Rwanda). Bwindi supports 300-350 gorillas (probably intermediate to the mountain and eastern lowland races), and encountering one of its two habituated troops is every bit as thrilling and moving as gorilla tracking in the Parc des Volcans.Yet the notion of Bwindi as merely a gorilla reserve is massively reductive: this magnificent forest, sprawling over steep hills nudging the Congolese border, harbours close to 100 mammal species, including a variety of monkeys and squirrels readily observed by casual visitors. A checklist of 350 birds includes 20 Albertine Rift endemics; the roads around the park entrance reliably produce Bar-tailed trogon, Black bee-eater and a profusion of forest greenbuls, finches and warblers, particularly when explored with a specialist local guide. The butterfly diversity is legendary, with more than 300 species identified — you'll often encounter a kaleidoscopic 10-20 varieties fluttering in one spot.Clustered around the park entrance at Buhoma is a community-run camping / banda site, together with a trio of smarter tented camps. Twelve tracking permits are available at Buhoma daily (a third troop of gorillas is currently being habituated further south at Ruhija). Permits are often booked up months ahead, so independent travellers without a reservation are better off heading to Rwanda's Parc des Volcans (or its Ugandan counterpart Mgahinga NP). Murchison Falls has been described as the most spectacular thing to happen to the Nile on its long journey from Lake Victoria to the Mediterranean. There's not much in the way of competition for this accolade, but that scarcely matters. Murchison Falls is unambiguously spectacular: the world's longest river funnelled through a narrow cleft in the rift escarpment to explode with brutal energy in a thunderous plume of foaming white water. The scenic highpoint of Uganda's largest NP, Murchison Falls is the target of a fabulous twice-daily boat trip from the park headquarters. Gargantuan crocodiles leer menacingly from the sandbars, conferences of hippo grunt amiably, Defassa waterbuck stare on in placid bemusement from the bank and an occasional elephant or buffalo makes its way down to drink.Aquatic birds — predictably profuse — include the shoebill, a large and eagerly sought slate-grey papyrus-dweller more easily located in Murchison than in any other African sanctuary. Terrestrial game is visibly recovering from the war-related slaughter of the 1980s. Drives in the south are erratic in game-viewing terms, but the undulating palm-studded grassland north of the river hosts estimable numbers of elephant, buffalo, Jackson's hartebeest, oribi and Uganda kob, a growing lion population and the localised Rothschild's giraffe and Patas monkey.In an effort to attract the tourist volumes of its pre-Amin heyday, Murchison Falls is serviced by one large upmarket hotel on the north bank, a luxury tented camp on the south bank, a midrange lodge on the Kampala Road and affordable huts and campsites at the park headquarters. Chimps, occasionally observed in the park's Rabongo Forest, are more regularly encountered on walking trails through the contiguous Budongo Forest (also a great site for birds), serviced by a campsite situated alongside the Kampala Road. 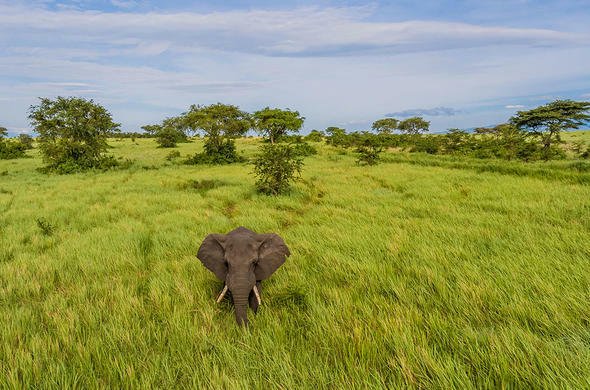 Read more on Murchison Falls National Park in UgandaContributors: Philip Briggs Copyright © Travel Africa. All rights reserved. Reproduction in whole or in part without the permission of the author is prohibited.